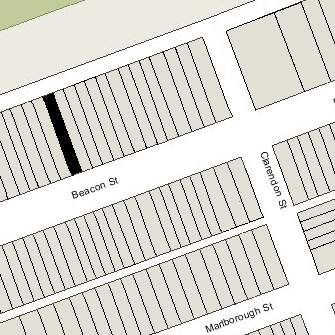 208 Beacon is located on the north side of Beacon, between Clarendon and Dartmouth, with 206 Beacon to the east and 210 Beacon to the west. 208 Beacon was built in 1862-1863 by contractor and builder John W. Rollins, one of six contiguous houses (198-200-202-204-206-208 Beacon), each built in the same design with all six unified by a single cornice and roof line. John Rollins and his wife, Elmira (Nutter) Rollins, lived at 85 Pleasant. Click here for an index to the deeds for 208 Beacon. On January 12, 1864, 208 Beacon was purchased by Harvey Jewell. The sellers were John Rollins and John Borrowscale, individually, and John Borrowscale and Albert Betteley as assignees in insolvency of Samuel Hazard. Harvey Jewell and his wife, Susan A. (Bradley) Jewell, lived at 204 Beacon. He was a lawyer. On May 5, 1865, 208 Beacon was purchased from Harvey Jewell by Christopher C. Chadwick and Thomas Handasyde Perkins, trustees under a marriage settlement trust for the benefit of Martha E. (Chadwick) Braggiotti, wife of Francis (Francois) Braggiotti. They had married in November of 1863. Christopher Chadwick was Martha Braggiotti’s brother, and Thomas H. Perkins was her brother-in-law, the husband of Elizabeth Jones (Chadwick) Perkins. Francis Braggiotti was an importer of fruit and later a banker and stockbroker. In the mid- and late-1870s the Braggiottis were living elsewhere and leased 208 Beacon to others. In 1875, it was the home of cotton buyer and dry goods merchant George Wellman Wright and his wife, Georgianna (Buckham) Wright. They maintained their primary residence at Pine Hill in Duxbury. By 1876, they had made 226 Beacon their Boston home. The Braggiottis were listed at 208 Beacon in the 1876 Boston Blue Book, but were not listed there in the 1876 City Directory. During the 1876-1877 winter season, 208 Beacon was the home of attorney Edward Avery and his wife, Susan Caroline (Stetson) Avery. They also maintained a home in Braintree, which was their primary residence. During the 1877-1878 winter season, 208 Beacon was the home of brothers William H. Cragin and Francis Henry Fullerton Cragin, a draftsman and later an architect. During the 1878-1879 winter season, it was the home of tobacco and cigar dealer Nathan Samuel and his wife, Fanny (Salomon) Samuel. They previously had lived at the Parker House Hotel, and resumed living there the next year. By 1881, they were living at 211 Beacon. During the 1879-1880 winter season, 208 Beacon was the home of John Harry H. Watson, his brother Frank Towneley Watson, and their sister, Mary Caroline Watson. 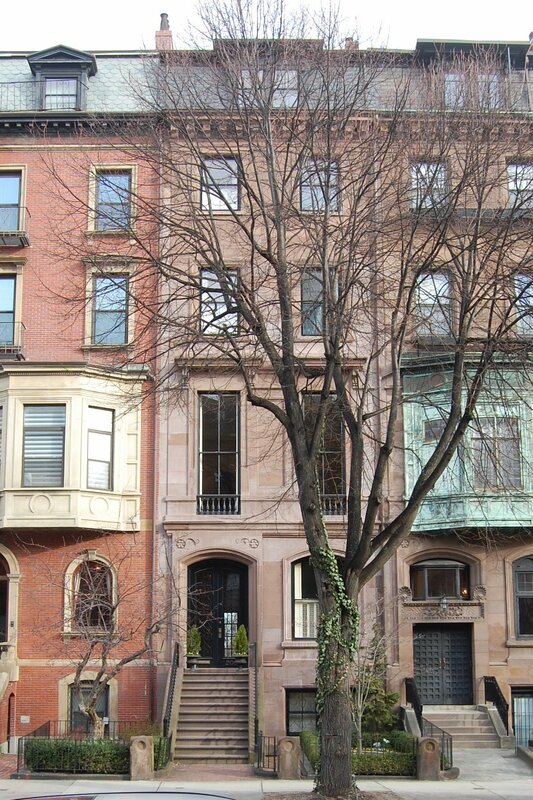 They previously had lived with their parents, James and Annie Eleanor (Stevens) Watson, at 41 Worcester Square. By 1881, John H. H. Watson, and probably his siblings, were living in Roxbury. 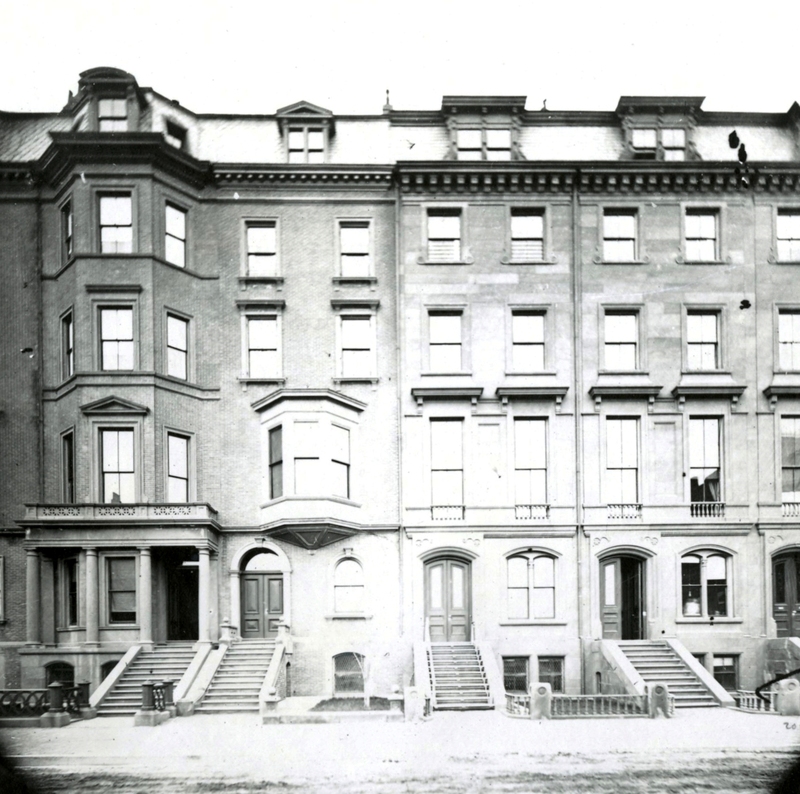 By the 1880-1881 winter season, the Braggiottis had resumed living at 208 Beacon. During the 1890-1891 winter season, the Braggiottis were living at Exeter Chambers (southeast corner of Exeter and Blagden) and 208 Beacon was the home of retired cotton manufacturer Francis Blake Rice and his wife, Sarah (Sallie) Blake (Austin) Rice. They had lived at 171 Marlborough during the previous season. By the 1891-1892 season, the Rices had moved to a new home they had built at 454 Beacon and the Braggiottis had resumed living at 208 Beacon. Francis Braggiotti died in August of 1893, and Martha Braggiotti continued to live at 208 Beacon with their son, Isidore. She died in January of 1898, and on February 10, 1898, Nathan Matthews, Jr., the successor trustee of Martha Braggiotti’s trust, transferred 208 Beacon to Isidore Braggiotti. Isidore Braggiotti continued to live at 208 Beacon during the 1898-1899 winter season but moved thereafter, probably to Florence, Italy, where he became a renowned music and voice teacher. By the 1899-1900 winter season, 208 Beacon was the home of Dr. George Julius Engelmann, a gynecologist, and his wife, Loula (Henslee) Clark Engelmann. They previously had lived at 336 Beacon. They also maintained a home in the Saxonville district of Framingham. Loula Engelmann’s children by her first marriage — George Oliver Clark, John Dudley Clark, and Louise Clark — lived with them. The Engelmanns continued to live at 208 Beacon during the 1901-1902 winter season, but moved thereafter and were living at their Saxonville home at the time of George Engelmann’s death in November of 1903. By the 1904-1905 season, Loula Engelmann and her children were living at 84 Commonwealth. On July 3, 1902, 208 Beacon was purchased from Isidore Braggiotti by Dr. Lloyd Vernon Briggs and William Tudor. William Tudor and his wife, Elizabeth (Whitwell) Tudor, made 208 Beacon their home. They previously had lived at The Beresford at 845 Boylston. He was a mining executive and artist. L. Vernon Briggs was a physician and psychiatrist and maintained his office at 208 Beacon. He lived at 112 Mt. Vernon with his parents, Lloyd Briggs and Sarah E. E. (Kent) Briggs, and also maintained a home in Hanover. He previously had maintained his office at The Beresford at 845 Boylston. On December 5, 1903, William Tudor transferred his interest in 208 Beacon to L. Vernon Briggs, and on October 11, 1904, Dr. Briggs transferred the property to Elizabeth Tudor. L. Vernon Briggs married in June of 1905 to Mary Tileston Cabot. After their marriage, they moved to 74 Mt. Vernon and then, by 1909, to 64 Beacon. He continued to maintain his office at 208 Beacon until about 1912, when he moved it to 64 Beacon. The Tudors’ five children lived with them at 208 Beacon until their marriages. Elizabeth (Elsa) Tudor married in November of 1904 to Count Alain Dedons de Pierrefeu and moved to New Jersey, where the Count was engaged in the steel business. Henry Dubois Tudor, an attorney, married in June of 1905 to Eleanor Gray and they moved to 310 Marlborough. Mary Tudor married in September of 1907 to Roland Gray (Eleanor Gray’s brother), a lawyer, and moved to 83 Marlborough. John William Tudor, a mining engineer, married in March of 1908 to Charlotte (Lottie) Hubbard Young and moved to Weston. And Delia Aimée Tudor married in October of 1908 to Louis Bartlett Thacher, a shoe manufacturer, and moved to 245 Beacon. William and Elizabeth Tudor continued to live at 208 Beacon until about 1915. They had moved by the 1915-1916 winter season, and by 1920, they appear to have separated and he was living on a farm in Georgia. 208 Beacon was not listed in the 1916 Blue Book. During the 1916-1917 winter season, 208 Beacon was the home of wholesale wool merchant Roger Sherman Dix and his wife Louise (Parrish) Dix. They previously had lived in Chestnut Hill. They also maintained a home in Greenbush. They had moved by the 1917-1918 season, and by the 1918-1919 season were living at the Hotel Bristol at 541 Boylston. By 1920, they had moved to 265 Clarendon. By the 1917-1918 winter season, 208 Beacon was the home of Milton Strong Thompson, a manufacturer of chemicals and rubber sheeting, and his wife, Abigail Adams (Johnson) Thompson. They previously had lived at 896 Beacon. They also maintained a home in Newburyport. They continued to live at 208 Beacon during the 1918-1919 season, but had moved to 105 Beacon by the 1919-1920 season. During the 1919-1920 winter season, 208 Beacon was the home of attorney John Kenneth Howard and his wife, Ruth (Gaston) Howard. They previously had lived at 353 Commonwealth. They had moved by the next season and by 1921 were living at 406 Beacon. On May 25, 1920, 208 Beacon was purchased from Elizabeth Tudor by banker and broker Laurence Paine Dodge. He and his wife, Anne Woodwell (Thurlow) Dodge, made it their home. They previously had lived at 212 Beacon. They also maintained a home in Newburyport. On February 14, 1929, Laurence Dodge transferred 208 Beacon into both his and his wife’s names. The Dodges continued to live at 208 Beacon until about 1930, when they made Newburyport their year-round residence. On April 29, 1930, they transferred 208 Beacon to his brother, Robert Gray Dodge, an attorney. He and his wife, Alice Woolley (Childes) Dodge, lived at 2 Raleigh. 208 Beacon was not listed in the 1931 Blue Book, and was shown as vacant in the 1930 and 1931 City Directories. On October 28, 1930, 208 Beacon was acquired from Robert G. Dodge by real estate dealer Henry C. Brookings. On May 12, 1931, 208 Beacon was acquired from Henry C. Brookings by George West Movius. Living with him were his mother, Mrs. Alice Lee (West) Movius, former wife of landscape architect Hallam Leonard Movius, his twin sister, Rose Saltonstall Movius, and his brother, Hallam Leonard Movius, Jr. They all previously had lived at 223 Beacon. Rose Movius married in February of 1932 to Potter Palmer, III, and moved to Chicago. Hallam Movius, Jr., an anthropologist and palaeolithic archaeologist, married in September of 1936 to Nancy Champion de Crespigny. After their marriage, they lived in Cambridge, where he was an instructor of anthropology at Harvard. Alice Movius and George Movius continued to live at 208 Beacon until about 1942. She moved to the Hotel Vendôme and he moved to Hartford, Connecticut. On March 1, 1942, 208 Beacon was purchased from George Movius by Mary Frances (Downs) Andrews, the widow of Dr. Frederick Francis Andrews. She previously had lived in Revere, where her husband had been a physician and Chairman of the Board of Health. She continued to live at 208 Beacon in 1944, but had moved to an apartment at 255 Beacon by 1945. On August 28, 1944, 208 Beacon was acquired from Mary Andrews by Gladys M. Whipple. She operated it as a lodging house. By 1946, she had moved to 256 Commonwealth. On March 20, 1946, 208 Beacon was purchased from Gladys Whipple by Dr. Robert Fleming and his wife, Jean Louisa (Palica) Fleming. They previously had lived in Brookline. He was a psychiatrist and also maintained his medical offices at the house. They also maintained a home in Duxbury. In September of 1951, Robert Fleming filed for (and subsequently received) permission to construct a two-car garage at the rear of the property. On July 1, 1966, the Flemings transferred 208 Beacon to their son, Dr. Thomas Corwin Fleming, also a psychiatrist. He and his wife, Cynthia Crosby Lester (Dunn) Fleming, made 208 Beacon their home and he also maintained his medical offices there. In 1965, they had lived at 1 Mt. Vernon Square, and he had practiced at Massachusetts General Hospital. After transferring the property, Robert Fleming continued maintain his medical office at 208 Beacon but he and his wife moved to 1 Mt. Vernon Square, where their son and daughter-in-law had lived previously. On June 19, 1981, T. Corwin Fleming transferred 206 Beacon into Cynthia Dunn Fleming’s name. On March 27, 2004, 208 Beacon was purchased from Cynthia Dunn Fleming by Kevin O’Hara, trustee of the IATSSCI Trust. 208 Beacon remained a single-family dwelling in 2015.